I’ve made this recipe a few times now and it’s always tasted yummy. One thing I do suggest is making the effort to get small grapes. The larger ones seem to turn into lip burning juice bombs. Oh, and never ever put your piece of hearthbread down on a surface you’ve just used for cutting garlic. Grapes and garlic don’t really go together. Who’d have thought it? Put all the sponge ingredients in the bowl of an electric mixer and whisk until smooth. Set aside for 10-30 minutes. To make the dough, add to the bowl the warm water, olive oil, sugar, salt and 3 cups of flour. Mix in with a wooden spoon, adding more flour if needed to make a soft dough. Attach the dough hook to the machine and knead the mixture for about 5 minutes. Detach the dough hook and cover the bowl with a damp tea towel. Set aside in a warm place until the dough has risen by at least double. Tip the dough onto a lightly floured bench and roll out approximately 3mm thick to fit into a shallow-sided baking dish approx 45x30cm. Brush the dough lightly with olive oil and set aside until it is well-risen and puffy. Depending on room temperature, this will take an hour or so. Half an hour before the dough is likely to be ready, turn on the oven to 220°C. When the dough has risen, use your fingers to press deep dimples into it. 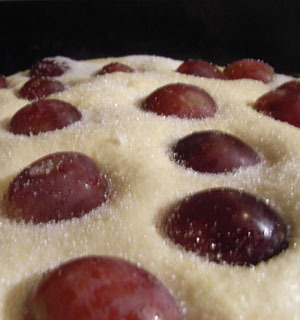 Scatter the grapes over the dough, so that many of them are lodged in the dimples. Use the flat of your hand to press the grapes firmly into the dough. 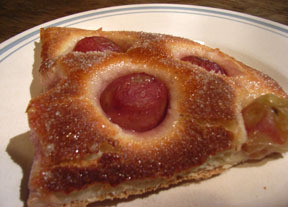 Sprinkle generously with sugar and bake in the preheated oven for 15-20 minutes until the dough is golden brown and the fruit bursting. Slide the hearthbread onto a rack, and leave to cool until lukewarm before cutting into 12 large squares. Serves 6. The recipe says to use a mixer but I did it all by hand and it was fine.